A firm has filed an application with the state to build a hospital north of the Lahaina Civic Center in West Maui. If approved, the hospital would be the second facility to offer critical care on the Valley Isle. 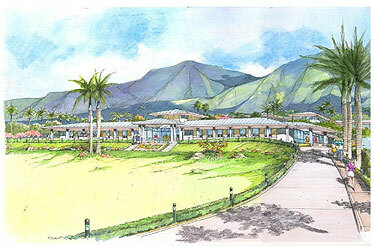 WAILUKU » A new Maui hospital is being proposed again on the Valley Isle, this time in West Maui. The Newport Hospital Corp. said its West Maui Hospital and Medical Center in Lahaina will complement the services at the existing state-owned Maui Memorial Medical Center in Kahului. Newport Hospital filed yesterday for a certificate of need with the State Health Planning Development Agency, which in October 2006 rejected a proposed Malulani Health and Medical Center in South Maui. Agency director Dr. David Sakamoto said Malulani Health threatened to drag down the overall quality of medical care in the county by competing against Maui Memorial for scarce resources. Newport Hospital President Brian Hoyle said the proposed West Maui Hospital is smaller in scope than Malulani and is designed to serve West Maui. "We are totally different," Hoyle said. "We're not a competitor to Maui Memorial or any of the other providers." Maui Memorial's Chief Executive Officer Wesley Lo declined to comment on the West Maui Hospital application and said Maui Memorial officials have not seen the final plans. If established, the proposed West Maui Hospital and Medical Center in Lahaina would be the second facility providing critical-care services on the Valley Isle. The only critical-care facility on the Valley Isle is Maui Memorial. A number of West Maui residents hope a new hospital in Lahaina would provide quicker emergency services. Ground ambulance service takes an average of more than 60 minutes to get from Napili in West Maui to Maui Memorial in Central Maui, West Maui hospital advocates say. "We have no doubt lives will be saved if we can build our West Maui Hospital," said Joseph Pluta, president of the West Maui Improvement Foundation. The proposed hospital would be located on 14.9 acres of land near the Lahaina Civic Center. The proposed hospital includes a 25-bed critical-care facility and a 40-bed skilled-nursing facility. The development cost for the hospital and nursing facility would total $51.5 million, according to Newport Hospital. Hoyle is the sole shareholder of Newport Hospital and owner of a chain of medical facilities in Iowa and Colorado. Under health planning agency procedures, once the application is determined to be complete, the agency conducts public hearings and submits recommendations to its director, who makes a final decision.